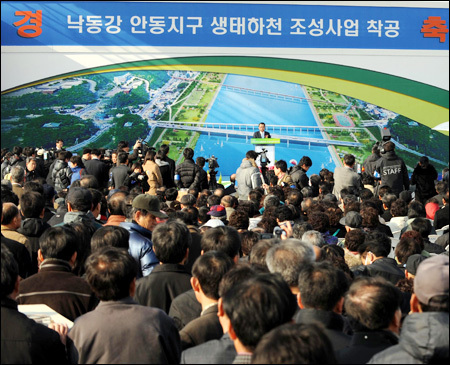 There has been a lot of government public relations spin distancing a grand canal project from President Lee Myung-bak's current ``Green New Deal.'' I want to make it clear nothing has really changed, and the main 'green' project is mostly greenwashing. Besides, half of the project's 50 trillion won is reputed to be just provincial `green' (greed) for Lee's home region of Gyeongsang provinces, with little else for the nation. The larger Green New Deal has some interesting green projects, though it's core is greenwashing. Drop the canal bit and you'll have a good assortment of eight other green projects. A short review of some of the facts of the canal project compared to the presumed ``New Green Deal" is in order. Last year, President Lee said his grand canal idea would involve the dredging of the Han and Nakdong rivers (and other things). It was estimated to cost around 17 trillion won, in a four-year project. There were immediate complaints that the real price would be closer to 50 trillion won. Last summer, in the face of protests, his government promised that the grand canal idea would be dropped if that were what the Korean people wanted. However, in early 2008, it only looks like a grander canal by stealth: half a year later, it still involves the Han and Nakdong Rivers being dredged (among other things). The price is now 18 trillion won (given currency depreciation, the same estimated price of the canal previously at 17 trillion won), and it's still a four year project now costing what it was expected to cost half a year ago: 50 trillion won. This grander canal is still conspicuously the only large project in the grab bag of nine different projects of the Green New Deal. It's fair to call it the grander canal because dredging is extended now to the Han, Nakdong, Geum and Yeongsan Rivers. In summary, the grander canal is the only large project in a buffet of much smaller projects, at the same price, involving the same rivers, and estimated to be completed in the same time. What takes the cake is that the presidential transition committee chairwoman Lee Kyung-sook said that the grand canal would take about a year to start construction. So instead of being delayed, the canal is right on schedule because it is to be started in about a year. The supposed difference now is claimed to be that the sluices and dredging channels deeper than six meters are promised to be missing. What if they lie, who is to know? Kwon Jin-seong of the land ministry said that despite strange public relations, the project is really secret! He said: ``The project is confidential just like all other governmental projects are.'' What if the confidential side has the same sluices and dredging channels, in this grander canal? Lee's government has already slapped down one of its governmental workers for noticing that there is no difference between the grand canal and the main project in plain site in the New Green Deal. If the depth of the project is just the difference, it's pretty much the same, and who is to know how deep they are going to dredge anyway. They could easily lie to the public and say they are dredging differently, though had the confidential orders to dredge deeper than six meters. Who could see the difference on the surface? No one. And here's the rub: in Lee's home region of Gyeongsang provinces, where the majority of the money is to be spent, who would complain? A full 47 percent of key government posts under Lee Myung-bak were ``quickly'' filled with men from North Gyeongsang Province. As for grander canal (confidential project of four major rivers being dredged), 50 percent of the budget goes to rivers in that province only. As another has commented, in the last presidential campaign, approval rates showed 90 percent for Lee and 7 percent for his rival Chung Dong-young in the Gyeongsang provinces. Vice versa in the Jeolla provinces. All over Korea, Lee won with about 48 percent a plurality not a majority. Is this a valid assessment for selecting a national leader? It is nothing but a measurement based on provincial greed. Is this a grander canal for all Korea or just a slush fund for Lee's crony region? I particularly like the ideas of the other eight projects in the plan ― though these are just cosmetic issues dolling up the grand canalization of Korea. I think the smaller projects have a long-term future orientation, as they enhance the ecology of Korea and thus its economic potential. However, the main project has no long-term green vision for Korea. It is short-term, pollutive, and self-destructive. Dredging could drop the entire water table ― a disaster for already shallow rivers in Korea. There are many other choices for Korea than destroying long-term ecological assets and most of the potable water system to give short-term, non-knowledge-based dirty jobs to the construction industry for four years. If flood control is the concern, it can be accomplished without 18 trillion won. If helping the construction industry is important, it can be done through green buildings in Seoul as promised already. The Korean population in the past 10 years has severely put off marriage because of a dearth of affordable housing. Housing construction for young couples (and future baby Koreans) is more important than a canal as population is dipping below replacement because of housing expenses. Korea's key industries are automobiles, electronics, superconductors ― and people/knowledge. These are part of a self-improving, value-added, knowledge economy that can have multiplier effects. Construction and trillion of won thrown at dredging will not have multiplier effects. It will encourage more pollutive raw materials and primary-economy based operations in Korea instead of secondary or tertiary ones of a knowledge economy. With the dredging South Korea's four main rivers, expect future ``Hebei Spirit" oil spills internally to despoil Korea's water supply and damage Korean agriculture. If you can find a ``clean, green canal'' in the world, I'd like to see it. Take a trip down China's toxic Grand Canal to see what you are developmentally sleepwalking into. I don't think any green canals exist. In the 1960s, U.S. canals in industrial areas were so polluted that they regularly caught fire. I think Lee is still a good presidential choice for a developmental Korea. His high-speed train network ideas, working with the semiconductor and automobile industries, and greater concern for clearing Seoul's foul air pollution (with cleaner buses) is future oriented and contributes to the knowledge economy. I'll congratulate him when I see the other eight smaller projects completed, however, Korea has come a long way in the past 40 years, and I don't want to see it repeat in the 21st century the ecological mistakes of the 20th century that other countries regret ― when Korea doesn't have to do so. The writer is a professor of environmental sociology at Ewha Womans University in Seoul, and author of ``Toward a Bioregional State'' (2005). He can be reached at mwhitaker@ewha.ac.kr The views expressed in the above article are those of the author and do not reflect the editorial policy of The Korea Times.